If you follow me on Instagram, you probably saw this really good looking photo where I bought a leather couch and stripped it for the leather. You might think it is looney tunes to buy a couch just for the leather, but do you know how much leather is? It's crazy expensive, so $25 for the couch was a steal! I'm chronicling all of the fun projects I'm making with all this leather on the blog, so you can follow along. I'm calling the series the Leather Couch Chronicles (click to check out all of the projects). So should we get to today's project? The other day I bought a cheap pair of sunnies at Marshalls. I love them, but of course they didn't come with a case. So I thought it would be a perfect opportunity to use my leather and make one! 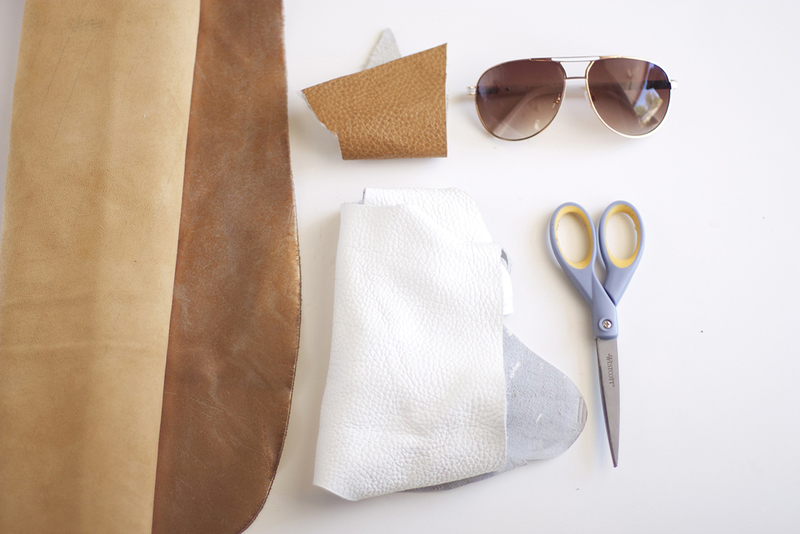 Here is how I made this two toned white and camel-colored leather sunnies case. To size your leather case, place your sunnies onto the leather. Fold a flap of leather over the sunnies. Pinch the sides where you will have seams. Mark where your pinches are and the height that you will need the case to be. Cut two even rectangles to this size. I cut mine to size 4" x 8," which I think will fit just about any pair of sunnies. Every pair I have fits inside, some with more room than others. However, if you want a tight fit for a particular pair, I recommend taking the above steps. Cut two quarter circles from your other leather color that will fit on each side like so. Make sure that they mirror each other (I'll explain why later). Sew along the curved line on each side using a sewing machine fitted with a leather sewing needle and leather sewing thread . Cut out the quarter circle from the bottom piece of leather. This is so the leather doesn't get too thick for you to sew through, and it creates a better look. Place the pieces of leather on top of one another with the leather sides facing out. Sew the two pieces of leather together on the bottom and the side of the quarter circle using the white thread (this is why you want to make sure the half circles mirror each other). Next sew the sides together using a tan thread. *Obviously if you are using different colors of leather you will use different colors of thread. Trim the edges and round the corners if you prefer. You are ready for the beach! If you like this project, check out Leather Couch Chronicles #3! It might be my favorite. And again, here are all of the posts that are a part of the Leather Couch Chronicles series. Are you guys going anywhere fun this summer where a cute sunnies case would up your look? Oh do tell, so I can live vicariously through you as I bake here in the 120 degree heat!